CCHD - Boycott This In November - ALL Localities! With all the rightly-placed focus on the elections that will occur in two days, I can understand that the upcoming annual CCHD collection this November has slipped the minds of many. Alas, it is a reality that now cries for our attention. In previous posts, I had suggested that we all boycott the CCHD collection in all localities with the exception of the Chicago Archdiocese. At the time, their local CCHD director had taken significant steps to improve the grant-making process, defunding various progressive organizations and redirecting those monies to pro-life organizations and those actively engaged in the Works of Mercy. Sadly, but not too surprisingly, that director was released from his position. There was an internal drive to have him fired. This latest development in Chicago, plus the unusual delay in CCHD's release of the names of current grantees, leaves me with the regretable but necessary task of calling for the boycott of the CCHD in all locations, no exceptions. I pinched this from fellow blogger Acts of the Apostacy. 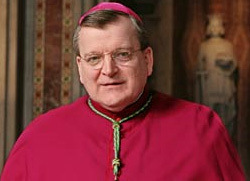 In a video-recorded interview with Tom McKenna of Catholic Action for Faith and Family, Cardinal-Elect Raymond Burke stated, “You can never vote for someone who favors absolutely the right to choice of a woman to destroy a human life in her womb or the right to a procured abortion." They are discussing a pastoral letter that Burke wrote in 2004 while he was archbishop of St. Louis. You may read it here. For that matter, you can save it to your own computer. The entire interview can be watched by clicking this link. There are also some youtube excerpts, but I'd suggest taking the time to watch the whole thing. On that site is a link that you may click to congratulate the Cardinal-elect. Then pass word of this onto your family, friends, and those who might need to hear some straight talk. Voters' Guides - Why Reinvent The Wheel? Sometimes the pro-abort websites are good for something - their voters' guides, for instance. For us, they give us clear indications of those candidates who are entirely unacceptable to us. For instance, here is NARAL's Voters's Guide. You can click on your state to see who's running for Federal office in your state. At the Montgomery County level, we have the Montgomery County Education Association's Apple Ballot Recommendations. Again, this is a great list of folks for whom you do NOT want to vote. If you want further information that exposes the leftist agenda of the MCEA, go to http://rottenappleballot.com/ and http://www.mcpscurriculum.com/rotten_apples.shtml. The MCEA is a chapter of the National Education Association. To get a gander of what the NEA considers "pressing policies" (none of them having to do with the education of children), go here. For a list of positive endorsements, here is MD Right to Life's list. I cannot vouch for the rest of the state, but as far as Montgomery County is concerned, I concur, with one addendum. They endorse only a few for the Montgomery County Council. I would say vote for those, but in addtion, we want to rid the Council of all incumbents. Thus, if you see an incumbent versus someone not on the MDRTL list, please vote out the incumbent. If any colleagues in other localities have input into other city or county elections, please advise. This is the October 26th episode of "Lopez Tonight". Bill Maher is being interviewed, and this interview was reviewed by the Culture and Media Institute. As you watch this, realize that Maher is speaking of you and me, whom he seems to believe are the Great Unwashed. Take heart! When they snort and snarl like that, we must be doing something right. They know they no longer have monopoly on the promulgation of ideas in the public square. A little while ago the below letter was bestowed upon some attendees of the VOTF meeting (and perhaps some attendees of an exercise class that seemed to be going on as well). As promised in that letter, I'm reproducing it below, so that they can click on hyperlinks. Pray that as they do so, they will be enlightened as to the true nature of the American Catholic Council. As mentioned before, I don't think the attendees were so much as enlightened as to the name "American Catholic Council" and the role that it played in this evening's event. Now the letter. Hopefully by now you were informed that the purpose of the meeting you just attended was to “provide input for the American Catholic Council”. The recent most (Oct 24th) bulletin announcement was rather nebulous about the name of this organization. It read that you were invited “to dialog with fellow Catholics on your hopes and recommendations for the church.” The previous (Oct 17th) announcement was a little more clear on the matter. That one added “your voiced thoughts and hopes will help shape recommendations of an American Catholic meeting in Detroit, MI next June.” Now if you really want clarity on this “American Catholic” meeting, go to this site, http://acn.americancatholiccouncil/.org/ and go right down the left column entitled “upcoming listening sessions” and see the “Montgomery County MD VOTF listening session”. While the exact location was not named, I think you realize now that you were there! Now why is VOTF being cagey about the nature of the organization for which they are “shaping recommendations”? Could it be because the Archbishop of Detroit, Allen Vigneron, has denounced this meeting and asked them not to meet in Detroit? Could it be because the American Catholic Council is an umbrella of dissident organizations advocating for everything from gay marriage to contraception and yes, the so-called “right” to murder unborn children? I truly hope the parochial staff of St Rose is unaware of Archbishop Vigneron’s statements. If they are aware, they are flouting the lawful authority of a bishop over his diocese. However, I do believe they were warned by others. At any rate, the local Voice of the Faithful is most certainly aware of the American Catholic Council’s status with the Magisterium. The fact is, they tried to conceal that truth from you! Why else would they not have been “up front” about the name “American Catholic Council”? Due to space limitations on this piece of paper, I cannot print all information available. Please go to the blog listed at the bottom of this letter and put “St Rose of Lima church” in the search box for the October postings. This letter (with hyperlinks) will also be online. Explore the links to get the whole truth behind the American Catholic Council. Do you want to jeopardize your faith – and your eternal salvation – by rubbing shoulders with the American Catholic Council? Remember the slogan from the 1992 Clinton campaign, "It's the economy, stupid"? People swallowed that hook, line and sinker. They voted their wallets over their consciences - and both were royally insulted. We need to vote as God would have us vote, and to do so keeping in mind the non-negotiable moral matters. Abortion, euthanasia, abuse of embryos, contraception, and the gay lifestyle must be opposed at the polls, regardless of other issues. Here Michael Voris declare unambiguously, "if a Catholic votes to put an anti-life, anti-marriage candidate in office, he might as well just pay for abortion for someone, because he has been part of the political machinery that has caused these intrinsic evils to come to reality." Are The Libs Getting Desperate, Or What?? 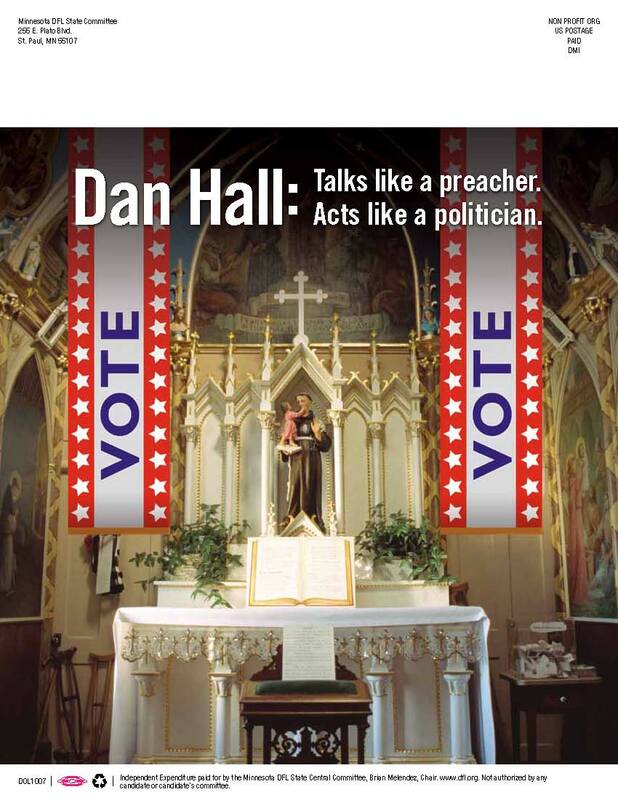 The picture to the left is what the Minnnesota Democratic party is using to discredit Dan Hall, candidate for Minnesota Senate. 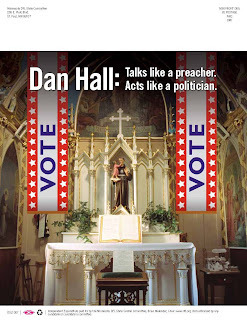 I understand that Dan Hall is indeed a Protestant preacher and that he is running an unabashedly pro-life and conservative campaign. Now as I said, Mr. Hall is a Protestant preacher. He states quite plainly that he has never worn a Roman collar. So why, oh why, is one featured in this ad? Might it be because on Mr. Hall's campaign website, he has the unmitigated gall to quote from Blessed Teresa of Calcutta? Here's the quote, and it's familar to many of us. "Being unwanted, unloved, uncared for, forgotten by everybody, I think that is a much greater hunger, a much greater poverty than the person who has nothing to eat." Mother Teresa. 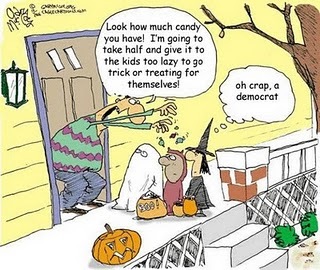 Notice that the headless individual is wearing a button that says "ignore the poor". What ignoramus would claim that's what Mother Teresa did? Now could it be that the Minnesota Democrats are simply looking for any old excuse to treat faithful Catholics as personae non grata? Why don't they just don themselves in white pillowcases and bedsheets, and burn a cross or two on a Catholic church lawn? 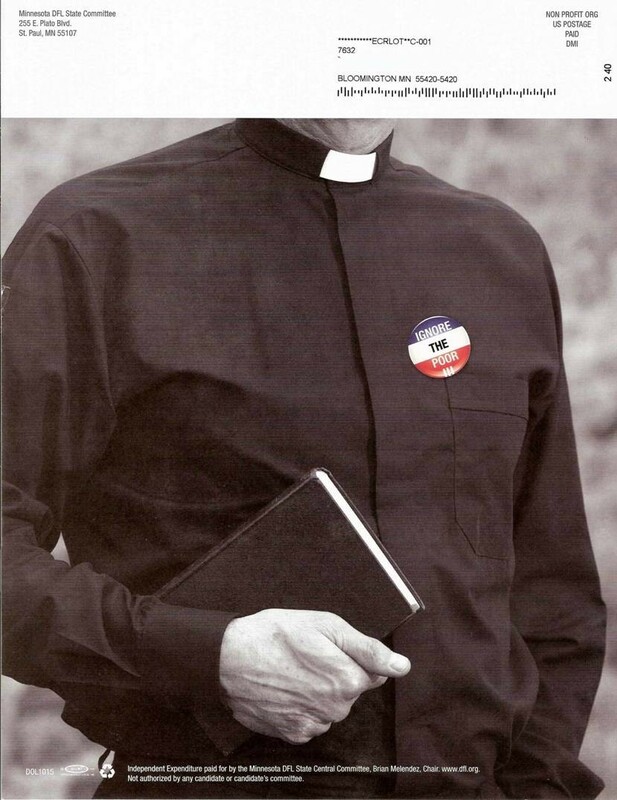 Oh, just in case you think the "headless priest" ad was a momentary lapse in judgment, to the right is another gem from the Minnesota Democrats. Again, Mr. Hall is not Catholic, but here you clearly have a side altar honoring St. Anthony of Padua. I truly think that in their desperation, the liberals are dropping their guard and letting loose with their anti-God and anti-life vitriol. Let us see them as the bigoted atheists that they are. Now if you have some sneaking suspicion that there might - just might - be ties between this bunch and the Messiah Most Miserable, you might be onto something. Read here. Have smelling salts handy! Take deep breaths! Most importantly, get to confession immediately to repent of these sinful philosophies! The Ten Commandments are precisely that - Commandments! They are not the "Ten Suggestions"! Who Says Blogging Has No Impact? Sometimes the biggest indicators we have of the fruit of our labors are the snit-fits in which the liberal, progressive types engage because we dare call them what they are. Read this piece by Rachel Zoll of the Associated Press. According to her, we're on a mission to "purge dissenters". Well, not quite! We're simply callin a spade a spade, so that the truth can be made known. The fact is that we cannot change the truth. It is given to us by Jesus Christ, who is Himself the Way, Truth and the Life. He mediates this truth and His grace through the Catholic Church. No one can change it or tweek it into something to his/her own liking. We simply seek to cut through the politcially-correct smoke and mirrors that humanists, progressives, socialists, etc use to delude as many as they can. I'm glad to see a piece like this. There are only two real reactions to a proper presentation of the truth - accpetance or rejection. Neutrality is not an option. Some obviously don't like the truth. In that case, all we can do is pray - and keep proclaiming it. Here is the 10/22 episode of Catholic News Roundup. A few days ago I posted an alert to a meeting at St Rose of Lima church, scheduled for this coming Wednesday. It's purpose is to "collect input" for the upcoming American Catholic Council meeting in Detroit, a meeting denounced by the Archbishop of Detroit. When I first posted on this matter, St Rose's October 17th bulletin was the current one. It spoke of "an American Catholic meeting in Detroit, MI next June". Well, a funny thing happened in the October 24th bulletin. The St Rose meeting was announced - with no mention whatsoever of the "American Catholic meeting in Detroit MI next June"! My! How very peculiar! I linked to the two bulletins so that you can compare them. Boys and girls, can we all say "deceit and obfuscation"? The American Catholic Council has a subsidiary website devoted to these "listening sessions". Here it is http://acn.americancatholiccouncil.org/. As you can see, its express purpose is to prepare for the ACC Detroit meeting. Go down the left side bar to where it says, "Upcoming Listening Session Assemblies". Right there you'll see the "Montgomery County MD VOTF Listening Session", scheduled for Wednesday Oct 27th from 7pm-9:30pm. This is the meeting at St Rose. So there you have it. The local VOTF is assisting the American Catholic Council in its defiance of the proper authority of the archbishop of Detroit by helping to plan this June gabfest there. St Rose of Lima parishioners, what are you going to do about this? Another great campaign ad! I'm glad they're exposing Boxer's arrogant treatment of our military. Please Support Missy Smith's Ads! The pro-abortion and abortion-apathetic establishment in the DC area (and the nation) are shocked - just shocked, I tell you! - that the results of their advocacy are being displayed for all the world to see. For the tiniest microcosm of the reactions, go to my earlier post and read the comments, and do the same for Jill Stanek's posts. Clearly they don't want their consciences stung, but it's only the guilty conscience that can be stung. Is the populace at large uncomfortable and even grieved? It should be. Remember, though, it's not the discomfort or grief that's the problem; it's the underlying evil of abortion that must be eradicated. For that to happen, there must be deep-seated repentance on the part of many - including the politician who passes abortion-permissive laws, the bishops and priests who refuse to obey Canon 915, right on down to the "ordinary citizen" who won't be bothered to give a damn about the murders occurring at the abortuary less than a mile from his/her home. There is mass media coverage being given to these ads. The Washington Times did a piece on Missy. It also disclosed the abysmal treatment that she is receiving from the DC Republican Party. Paul Craney, the executive director of the DC GOP, went so far as to ask Missy not to run for that seat. Mind you, there never was another Republican bucking for that nomination. He'd rather have no one run than have to face that elephant in his living room. He admitted so much when he said, and I quote from the Times article, that abortion "is an issue we have skirted because it needs a well-thought-out plan." (Correction: this "skirted" quote came from Tim Day, one of the GOP candidates for City Council) "Well-thought-out plan" my arse! Talk about a lame cop-out! Mr. Day, Craney et al, it's called the GOP party platform! Have you read it? Do you adhere to it? The answer to that second question is obviously a big, fat "NO". He has lots of company - the Montgomery County GOP chairman likewise doesn't adhere to the platform - per a public confrontation that I had with him in spring of 2009, but I digress! Needless to say, people like Craney and the rest of the GOP establishment are why there's a Tea Party movement. These ads will continue to run through Election Day. They do cost money. Please go to her campaign site http://www.missysmith2010.com/ to contribute any sum of money that you can. Thank you. I thank Steve Mosher and the Population Research Institute for this concise, clear video. Click here if you cannot see embedded video. This is why Sister Carol Keehan, and all who coddle her (including folks wearing red hats) have betrayed millions of babies, self-delusion notwithstanding. This is also why we need to get to the polls en masse on November 2nd - to remove the cabal that voted for this mess and to replace them with people who will repeal it. I thought abortions were supposed to eliminate child abuse - you know, because all children are wanted now! Or so the saying goes. However, it seems that not one month can go by where we don't hear about a newborn being found in trash bags, dumpsters, left in the woods, etc. Some fortunately are rescued - sadly, others are found dead. In Calgary, a man rescued a baby from a dumpster. The little boy was taken to the hospital and was in stable condition. Later, police informed the rescuer that he had rescued his own son. Read the rest of the story at Lifesite News. Often, women are dragged into the mills by abusive boyfriends. But often enough, it is the father who futilely argues for the life of his child as the mother hard-heartedly stomps into the mill. We urge such men to put a little more steel in their spinal columns. Often enough, they do, and both walk out of the mill - with their baby safe. Pray to St Joseph that he'd intercede before his Divine Son for the graces for these men to discover true fatherhood. Want proof? Well, read on. Last week, a man in Ohio was apprehended after he attempted to force his girl friend into an abortion. It seems to be the "easy out" for these fellows who want to use women and then get rid of "the evidence". As I've said previously, I see this all the time in front of the abortuary where several of us offer Christian witness. Fortunately he was not successful in harming his unborn child. Closer to home in Oxon Hill, MD, a similar situation ended in the man murdering the woman after she refused to abort her child. The Gazette reports that the man was sentenced to 30 years for her murder. Read the story and ask yourself just exactly how women are being helped here. Abortion is seen as an "easy out". When the mother-to-be listens to her maternal instincts and refuses, the man, if unscrupulous, will take that as an excuse to perpetrate violence upon her, sometimes with deadly results. In front of the abortion mills, it is painfully obvious that there is a fear of violence in the face of many women going in with male companions. Those who call themselves "pro-choice escorts" betray their lack of integrity by turning blind eyes towards the suffering women they claim to champion. I challenge them to prove me wrong. According to their October 17th bulletin, this "Peace in Action" gabfest will occur on November 7th, from 2:30 pm-5:30pm. The keynote address will be delivered by Rabbi David Saperstein, Director of the Religious Action Center of Reform Judaism. Realizing that Reform Judaism often embrace pro-abortion positions, I decided to explore their website. Here's the website's write-up of Saperstein. Read thoroughly. Notice that he sat on the board of People for the American Way. He was also dubbed "one of the most influential shapers of religious issues in national elections". Well, given his affiliation with PAW, we have a decent idea of his ideological tilt. Oh, by the way - he delivered the invocation on the final day of the 2008 Democratic National Convention, just before Obama's acceptance speech. Now look at the left side bar, under "key topics". Under the "abortion" tab, they unabashedly state "The Reform Movement has long been staunch supporters of women’s reproductive rights." Any questions? Now look under "LGBT equality". They opposed California's Prop 8, link to other gay-rights groups, and yes, they threw the Boy Scouts under the bus. Ladies and gentlemen, let me be very plain. Anyone who espouses such anti-life values that go against any kind of traditional Judeo-Christian morality, and who leads organizations hell-bent on promoting libertine and progressive agendas, such as Mr. Saperstein, has no business teaching anything in a Catholic church. Such a person with such warped beliefs simply doesn't know diddly-squat about the elements of true peace. And he is ostensibly leading a dialog on the topic? That's an abysmal joke! I fault not so much the rabbi, but the pastors and priests of St Camillus who would give approval for such a debacle to occur on Catholic grounds. By the way, notice something else about this scheduled event. Mr. Saperstein will receive "responses" from three others. Amongst those, what denomination might be missing? Any guesses?? If you guessed "Catholic", give yourself a prize! Do you see the politically-correct toadying in which the St Camillus priests are engaged? In offering the use of the property while not speaking, they simply engage in voluntary boot-licking! Every decent Catholic at St Camillus should be outraged that a forum is being given to a pro-abortion rabbi to give legitimacy to his advocacy of baby-murder. Contact the pastoral staff here. St Rose of Lima Church in Gaithersburg has a well-deserved reputation for harboring and promoting dissent. However, this is beginning to take on more ominous undertones, as my colleague at An Archdiocese of Washington Catholic pointed out a few days ago. This parish has been harboring a Voice of the Faithful group for several years now, going so far as to announce VOTF meetings in its bulletin that occur on parish property. The most recent bulletin announces such a meeting, but with an insiduous little advertisement. Look on the second page, under the "community" column, second item from the bottom. You are invited to "share and dialog with fellow Catholics on your hopes and recommendations for the Church. Your voiced thoughts and hopes will help shape recommendations of an American Catholic meeting in Detroit MI next June." What meeting? Quite frankly, the St Rose VOTF seems rather cagey about the nature of this "meeing in Detroit". That's because the Archbishop of Detroit, Allen Vigneron, has denounced the American Catholic Council in general, and the planned meeting in Detroit in particular. He made quite plain that this "council" does not at all speak for the Catholic Church and has asked them to cancel any plans for a meeting in Detroit. Thank you, Archbishop Vigneron! Let's take a look at the American Catholic Council's website. They are quite unabashed about their goals. As you read its various sub-pages, you'll notice the none-too-subtle influence of the heresy of americanism - that is, the heretical opinion that the Roman Catholic Church must let itself be influenced by the secular American culture, rather than lending its truth to the culture. 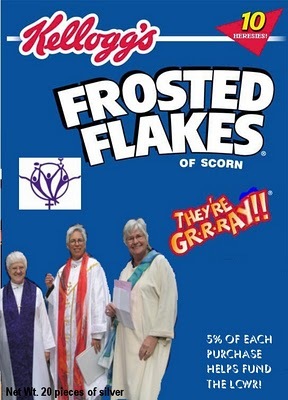 Click on the links subpage and see an entire list of the "usual suspects", openly dissenting organizations: New Ways, Women's Ordination Conference, Take Back Our Church, etc. The "declaration signatories" reveals more: Pax Christi, Dignity.. You get the picture! I suggest you keep an eye out for this sort of thing going on in your parishes. A blogging colleague of mine observed that in many crucial ways, the two Americans are polar opposites on some key issues regarding the Church. I'll let you read his observations for yourselves. I will say that I'm in complete agreement with his observations. Labels: Archbishop Raymond Burke, Archbishop Wuerl, Cardinal. That's what she calls herself. "Judy" from Arizona is standing up to the SEIU. Apparently the latter has called for a boycott of Arizona due to the governor's tough stance on illegal immigration. If the name "SEIU" sounds familiar, it should. Recall last May when several hundred of these union thugs descended upon a bank's home and went onto the man's front porch. I need not repeat my entire post; please read it here. I like this lady! See in the video below how she's giving them a taste of their own medicine. But there are some differences. There's only one of her versus a whole office-full of them. In May, there were hundreds of them versus the banker's young son who was understandably frightened. But she stands her ground, as we all must. In my posts, I pointed out the unsavory connections between SEIU and Just Faith, which is festering in too many Catholic parishes in the area. Stay clear of Just Faith, if the course is offered in your parish, and don't be afraid to let the pastor know why. Who seems to be doing that with some frequency? "Nun" other than Sister Carol Keehan! According to this online White House Visitor Log, she's been there 14 times since March 2009, just shortly after the arrival of the Messiah Most Miserable. Now just what might have been a frequent topic of conversation? That's not hard to guess. How to cram the Obama Hell Bill down the throat of America had to be high on the agenda list for a good number of those little chats. Interesting. Labels: Obama Health Care bill, Sister Carol Keehan, White House. They seem to have abandoned teaching antiquated concepts as reading, writing, math, etc. At Harvey Middle School in the Glover Park neighborhood, children as young as eleven years old were given the so-called "Making Proud Choices" Survey. Were the parents given the opportunity to opt their children out? That cannot be claimed with a straight face when the notices were sent home the day the survey was administered. Read the article from Culture News. I'd advise you to look at the linked material on that site. Is the survey "all that bad"? Lest someone think I'm merely being alarmist, I now link to the survey, that Fox News scanned and put on line - here. DC residents, what will you do about this? Let's Import Some Polish Bishops! Catholic bishops in Poland have made clear to their parliament that if they vote for state funding of in-vitro fertilization, that they will be excommunicated. My hat's off to them! Thanks be to God for bishops acting like shepherds and not politicians themselves. A word to the "People for the (pseudo) American Way" types.. No one is forcing anything on those MPs. They don't have to call themselves Catholic. However, they don't define Catholicism. The bishops are the leaders of the Church over there. The authority of the bishops was laid in place by Jesus Christ Himself, and it is within the purview of the bishops to define what it is to be Catholic. Should the MPs dissent from that, well, they're not Catholic. Got that?? Let us hope that they do, if only for the sake of their own immortal souls. Dr. Mildred Jefferson, a long-time pro-life activist and a founder and past president of the National Right to Life Committee, passed away yesterday at the age of 84 yrs. Although her pro-life activism was the most prominent aspect of her life, she had many other accomplishments. She was the first African American woman to graduate from Harvard Medical School. This wikipedia article cites many other "firsts" for Dr. Jefferson. She also voiced well-founded criticism of the hypocrisy of the Democratic Party towards minorities and the poor. Think about it - the so-called "party of the little man" and "party of compassion" espouses and facilitates the murders of the littlest amongst us who stand in most need of compassion. She saw through that set of smoke and mirrors. That's why I doubt that you'll see any feminazi group such as NOW pay any sort of tribute to the strides she made. Dr. Jefferson, rest in peace - and pray for us who carry on the pro-life battle on earth! I urge you to read the full article at Lifesite News, which also contains links to the full address and to the video. Archbishop Burke has spoken on this subject before, and has also been quite plain in proclaiming truth. I urge all prelates in the United States, and the world, to take seriously to obey Canon 915 in dealing with those politicians who remain recalcitrant. That's an obligation, not a "pastoral option". It's not a matter of "turning Holy Communion into a weapon". It's a matter of preserving the Blessed Sacrament from blasphemy and preventing the politician from committing yet another mortal sin, that of sacrilegious Holy Communion. I also raise the question of whether or not the knowing distribution of Holy Communion to such a person constitutes formal and material cooperation with the blasphemy - a serious matter in and of itself, I'd think. On September 17th, I gave "first notice" about the blasphemy at the Shrine of the Immaculate Conception that is scheduled to occur on Tuesday, November 16th. It is called "The 31st Annual Interfaith Concert". It is being produced by the Interfaith Conference. I urge you to look at the link to the September 17th post, for contained therein is some information about the foundation - namely, how it greases the skids to the heresy of indifferentism. The notice I just received informs me that Fred and Lesley Israel will be honored. Just who are they? The announcement doesn't say a whole lot - but a person's politics does say lots about their beliefs and governing philosophies. A person's politics govern how he/she donates. Ladies and gentlemen, I'm sure you are aware that your contributions to candidates for Federal office are a matter of public record. As such, websites are devoted to the same - newsmeat.com is one of them, and that does tell a story about Fred Israel. You can link to that record here and here, but I'll just highlight some key recipients of his donations over the years: Bill Clinton, John Kerry, Barbara Mikulski, Nancy Pelosi, Steny Hoyer, Mark Shriver, Frank Kratovil - pro-abortion Democrats (save for one donation to Phil Graham) all. Lesley Israel has made it a point to contribute - several times - to Emily's List, which is explicitly devoted to electing pro-abortion candidates. Others on her list include Mikulski, Ben Cardin and yes, the Messiah Most Miserable himself. With their last name, I don't believe the Israels are Catholic, so it's incorrect to state that they are violating their creeds with such contributions. However, the question must be asked - why are supporters of abortion rights being honored at a Catholic Bascilica? In fact, why is the entire blasphemy being allowed to occur there? There will be Baha'is, Buddhists, Muslims, etc singing songs and praying to their false gods on a Catholic altar! Ladies and gentlemen, can we say the word "abomination"? Here is contact information. Please let your concerns be made known. Thank you. All across the nation, America Needs Fatima is sponsoring Rosary Rallies to be held tomorrow, Saturday October 16th, at noon. One such rally will occur in Silver Spring Maryland - in front of 1400 Spring Street, which houses a Planned Parenhood abortion mill. Here is a map of the location. From the Capital Beltway, take the Georgia Avenue exit south towards Washington. After the 16th Street turn-off to the right (stay on Georgia Ave), you'll soon see a park on your right. At that intersection is Spring Street. Turn right. There is public parking on the street. If the spaces are taken, ask other people praying to direct you to the public parking garage, only two blocks away. Missy Smith, my friend, fellow Catholic and pro-life activist, is the Republican candidate for US Congress from Washington DC. She is attempting to unseat Eleanor Holmes Norton, who votes consistently for the murder of tiny babies. Part of her campaign is the education of voters, both DC and beyond, of the ramification of abortion - the utter violence done to the helpless child. I'll post these below. As Father Pavone says, "America will not end abortion until it sees abortion." Please visit the campaign website http://www.missysmith2010.com/ to read her story and to donate. These ads will air during prime time and the accomplishment of this is expensive. DC residents! Vote for her! Click the "read more" to see the ads and a letter from Missy. On September 18th I reported that Montgomery County Councilperson Duchy Tractenberg went down in the primary in her bid to retain her Council seat. At the time, there were allegations of mismangement of NOW funds while she was Montgomery County NOW's treasurer. Now the Montgomery County chapter of the Fraternal Order of Police is calling on state and county officials to investigate these allegations. I am receiving word of this from Lifesite News. I also link to this Montgomery Gazette article. As I mentioned before, Trachenberg has been an absolute menace to unborn babies and tradtional families in Montgomery County. So has NOW. I have no dog in this fight between Trachtenberg and NOW. I am glad that the world can now get a glimpse into the moral vacuity of those who promote baby-murder and sexual perversion. In Fatima, Portugal, Our Lady of Fatima concluded her apparitions with the Miracle of the Sun. See the last two segments of the 1950s movie. (Click here and here if you can't see the embedded videos). Our Lady specifically requested, among other things, that Russia be consecrated to her Immaculate Heart. She was very specific, now, wasn't she, in naming Russia? That has not happened. Some try to pass off the consecration of the world by Pope John Paul II as the fulfillment of her request, and point to the collapse of the Iron Curtain as proof. Not so! As rebuttal to their cop-out argument, I need only say one word - Putin! She asked, from us, frequent Masses, Confessions, Rosaries. We must comply, as the world hangs in balance. Sister Carol Keehan - "Top Health Care Leader"? The Worldwide Vincentian Family posted an article about Sister Carol Keehan (who sold out to Obamacare for the Pen of Perfidy) being named by "Modern Healthcare" as "Top Health Care Leader". Of course she's painted in a wondrous light. Check out the comments; most of them are pathetic, as they demonstrate the cluelessness of so many professed clergy and religious. I posted this in the comment section. Congratulations? For what? Selling untold numbers of unborn children and vulnerable elderly down the river, hiding behind “executive orders” that everyone with common sense knows are made of vapor? For what? Governmental $$$ for the CHA? A cheesy pen?? The REAL evaluation will come at the end of your life, as it will for us all. Someone else just urged you to “blaze on”; I hope that’s not too prophetic! It is "awaiting moderation" so it may not see the light of day. Visit that site, though, and leave them your own thoughts! On Friday, I posted about Obama's trip to Bowie State to bolster O'Malley's gubernatorial campaign. As noted, a number of local Democrats addressed the audience. Among them was MD State Senate President Thomas "Mike" Miller. He said that "we're not going to stand for the tea party here in Maryland." You might recall that I publicly asked him what he meant by that remark. In my initial research, I overlooked this Washington Post article that just might shed some light on my question. I'll pull in the quote from Miller. "We're not going to stand for the tea party here in Maryland," Miller said to raucous applause and whistles. "When we're through with them, they're going to be in the Chesapeake Bay, floating out to sea." At the very least, he seems to be taking gaffe lessons from Joe Biden. However, there is no mistaking the violent fantasies here. "Mere metaphor" you say? Consider - were this some conservative making this quip about some progressive sub-group, we all know damned well that the hue and cry for his/her personal destruction would resound through the mainstream media. Now here's another possible "inspirational video" that helped fuel Miller's little snit-fit against conservative people. Behold. (Click here if you can't see embedded video). And how about People for the American Way or Americans United for Separation of Church and State? Where are all these champions of the "wall between church and state" in this situation? Bishop Stephen Blaire of Stockton CA is telling people to vote against their Proposition 23, which would delay implementation of a "mini cap-and-trade" measure. Of course the measure is based on junk science, but who cares? At any rate, why aren't the ACLU et al all over the bishop? Oh, wait! I forgot! It's only when the Church comes to the defense of unborn babies, traditional marriage and Judeo-Christian morality that these progressives knot their knickers and screech bloody murder about "church versus state". When church officials are spouting progressive mantras, as is Bishop Blaire, they look the other way or even congratulate them. See how it works? Sister Carol Keehan, according to this American Spectator article, is now busy in "damage control" mode. Now that the Obama Hell Bill has been passed, thanks in no small part to Sister's influence on Bart Stupak and others (for which she was awarded one of the signing pens), she is busy trying to white-wash the mess she facilitated. Note - she isn't trying to correct things, just sweep them under the rug so the truth doesn't hurt her progressive pals in the November elections (and let's make sure it does!). In Scranton, PA, several Catholic hospitals have closed. The CEO of one of them, Kevin Cook, when initially asked about the cause, said quite forthrightly that the Obama Hell bill was a factor. That was his first statement. It appears that Sister Carol got to him and he subsequently issued other, different statements. I need not repeat the article - please read it. I will point out that these hospital closings are just the first, and are only a harbinger of the unraveling of the US health care industry, unless we reverse the disaster of the Obama Hell Bill. All you fans of Sister Carol Keehan (and I mean you, Gonzaga administrators!) bear this in mind when you and/or your loved ones find healthcare just a little harder to obtain! Of course Sister Carol Keehan isn't buddy-buddy with only the Messiah Most Miserable. She seems to be quite chummy with Cardinal McCarrick. This woman, who should have been barred from Holy Communion under Canon 915, actually did one of the readings during the Cardinal's birthday celebration Mass. Clergymen who cozy up to dissidents such as Sister Carol actually grease the skids as civilization careens into the pits of hell. PS - Read what my colleague at Throw The Bums Out in 2010 has to say about this! Calling All Actors - To Be Obama Town Hall Audience!! The foregoing title is not a joke! It really is happening! Look at this page from backstage.com. It's the October 7th entry, advertising for a "special" MTV-broadcast affair on October 14th. Since I'm not a subscriber, I cannot see the rest of the advertisement. However, resistnet was able to get to it; read it. Don't you just love the line where they want to "ensure that the audience represents diverse interests and political views" by asking those of the applicants? C'mon now! If they were truly interested in "diversity", they wouldn't ask that question - or do they think everyone just jumped off the cabbage truck? Not only that, but the applicant must submit a "recent" picture. C'mon, now! The Messiah needs diversity -the appearance of diversity, that is! If the Obama cartel is openly getting actors for this "town hall", why should we not think that they've been doing this all along? Let's think back to last week's "town hall" at Bowie State! Weren't some things about that event simply odd? Why did all those people "faint", in a manner reminicient of the swoonings during Obama's campaign tours? Is it ever so slightly possible that some people were directed to "faint", to demonstrate that the Messiah Most Miserable could still wow a crowd? How about that "heckler"? Am I the only one who thinks it's odd that he was allowed to remain after he "was shoved back"? In all other previous hecklings of Obama, the offender was always evicted and sometimes even arrested. This person was "shoved back" (no resistance? ), and then was allowed to remain. I would think that if he was a real opponent of Obama, that he would have left of his own volition after being shoved back. Of course I can't say for sure, but that whole incident seems rather odd. If either one and/or the other is true, what does that say about Obama? More to the point for Marylanders, what would that say about the Maryland Democrats? Are they so pathetic that they might need a faux audience to gin them up? Just some food for thought - take it or leave it as you deem best! If this ballot initiative passes in Colorado, it will be a landmark step towards securing protection for the unborn children. Watch as ALL's Michael Hichborn explains. (Click here if you can't see embedded video). I saw this from Matt Abbott regarding Father Richard Perozich of the Diocese of San Diego. I urge you to read the entire message that Father gave to his congregation. I cannot quote the entire address here, but will reproduce one key paragraph. All you "progressive types", deep breaths as you read this truth. "For us Catholics the basic issues are: Life from conception to natural death, that is, protection of the unborn, those with life, and those who are sick; protection of new life in its most nascent form, the embryo; protection from cloning to farm body parts; protection from sexual deviance in the form of pederasty, homosexuality, adultery, fornication, prostitution." Let me explain, along with Father. If someone promises all sorts of things such as end to poverty, health care for all, etc, etc, but is wrong on any of those basic issues cited in the preceding paragraph, he/she does not deserve a Catholic's vote. If any Catholic runs for office and his/her platform dissents from the Church's teachings on the above matters, his/her pastor must obey Canon 915 with respect to that recalcitrant politician. How can that be any more clear? That brings me to the second part of this post - Wisdom on Windshields . This is a tool I developed to help answer a crying need, as I'll now explain. Due to poor catechesis, many Catholics do support anti-life and anti-family candidates. You might see the telltale signs on their cars in the church parking lot in the form of bumper strips and other signage to that effect. Clearly that person needs to be educated. I've developed this so that you can enlighten your fellow Catholic in a manner that is discreet, and so that you don't have to worry about looking for the car's owner, being late for Mass, etc. Wisdom on Windshields is an educational flyer that you can put on that car's windshield; it briefly describes the teachings so eloquently proclaimed by Father Perozich and refers to other sources. You may download it here and have it handy on your own computer. Print out a supply and always take them to church with you. You'll never know when you'll have need of them. The fact is, when you use them, you are exercising several of the Spiritual Works of Mercy: instructing the ignorant, rebuking the sinner, counseling the doubtful. The Messiah Comes To Bowie! Yesterday, at Bowie State University, the Messiah Most Miserable descended upon Bowie State University to rally for the reelection of Martin O'Malley as governor of Maryland. I had heard on the radio that quite a few people passed out during his address and had to be taken away. Some opined that the heat caused it. Folks, I live here, and it was not hot here yesterday. This Baltimore Sun article gives a clue as to why these people fell ill. Apparently the gates opened and people started arriving about five hours before Obama. They could not bring any food or drink inside. I find that curious. A cynical wag might opine that the messianic cartel was banking on a repeat of the fainting stunts that accompanied Obama on the 2008 campaign trail. At the very least, it was reckless of the university and/or security personnel not to allow people to bring food with them - so much for caring for the little guy. Now let's talk about their tolerance here. At this rally, Thomas "Mike" Miller, Maryland Senate President, had this to say, and I quote, "We're not going to stand for the Tea Party people here in Maryland." Oh, really? Dear Senator Miller, just what, pray tell, do you intend to do about us? We're here to stay, we won't be silenced, and you had better get used to it! Moving along in the article, we see US Senator Ben Cardin use a bogus charge against Christine O'Donnell to take a swipe at her, saying, "we don't need any witchcraft." Can you just imagine him saying that about anyone who holds other creeds? Why doesn't he now just say, "we don't need any jihad"? Do you think that will happen? Neither do I! Let's get out there on November 2nd. Remember, not only is O'Malley up, but the whole Maryland cabal is too - including Miller, who "will not stand for the tea party people". The annual Red Mass occurred this past Sunday, October 3rd at the Cathdral of St Matthew in Washington DC. Many of us were unable to be there (as we were last year), owing to other commitments. Unfortunately, but not unexpectedly, it appears that at least one sacrilegious reception of Holy Communion occurred. If you're of the mindset that ecumenism means that all denominations are equal (they're NOT! ), or are into a "least-common-denominator" type of mutated "christianity", I advise you NOT to watch this video, as truth and fact may cause some serious upset. If, on the other hand, you are seeking for the truth, be it ever so unpopular and politically incorrect, then please proceed. (Click here if you can't see embedded video). I see it all the time: reluctant women being pressured into aborting either by male companions (I refuse to call them "men") or by their parents (also unworthy of the title "parent"). Often the women are in tears. The so called "pro-choice" escorts, these reputed "champions of choice", turn a blind eye to the plight of the women -for which we soundly rebuke them. Several times a woman manages to break away and seek our help. To our knowledge, no gun has ever been used in any of our incidents. However, there was a case of it in Columbus, OH, as reported by Lifenews. Fortunately police were alerted. They found the male in a car, with the gun. They arrested him. I now refresh your memory of the Kampfs, a New Hampshire couple who literally kidnapped their daughter to drive her to New York for a forced abortion. She managed to escape and call the police. Her parents were arrested and she did give birth to a little boy. Ladies and gentlemen, these stories abound. Not all of them have happy endings. Some males murder the women when they refuse to go through with an abortion. There are the beatings, the expulsion from homes, etc when the women try to fight for their babies. For the most part, the so-called "pro-choice" community turns a blind eye (although some do have enough integrity to try to help). This is not pro-choice. Abortion is pro-murder, pure and simple. First, thanks to American Papist for the tip on this one. 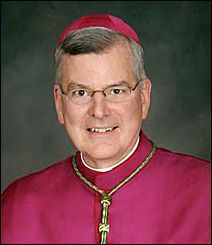 Archbishop John Nienstedt of the Archdiocese of St Paul-Minneapolis denied Holy Communion to 25 "rainbow sash" types who were protesting the Church's stance on the sanctity of marriage. I urge you not only to read the full article, but to take the suggested action to voice support for the archbishop. Already one of his priests acted to undermine his authority by giving Communion afterwards to the protesters. One can only imagine that the Archbishop will suffer additional fallout, and I regret pointing out that some of the opposition will come from some of his brother bishops who should know better. Dear Bishops! Here Are Some Helpful Suggestions! Actually, some of the suggestions are formally incumbent upon the clergy by Canon Law, such as Canon 915. Implement these, your excellencies and your eminences, and watch Mass attendance, donations, spiritual life, vocations, etc soar! In addition to the post from yesterday regarding the surveillance of the Fairfax 40 Days for Life, there are other incidents of pro-life and pro-family Christians suffering retribution for merely voicing their convictions. I will give the links to the relevant stories on other sites. On September 27th, a pro-life group called the Survivors were arrested for standing on a public sidewalk as they shared pro-life truth to a high school. They were not on school property, but the sidewalk. Read the Lifenews account. Yesterday, in Ontario, five pro-life college students were arrested when they attempted to set up a pro-life display at Carleton University. See the Lifesite News article here, along with the youtube clip. These are just the latest incidents this week. Fellow pro-lifers and Christians, if we don't start using our First Amendment rights to stand for our beliefs, we will find these rights stripped from us with impugnity, as the right to life is brazenly stripped from unborn children. Police State Watching 40 Days For Life Activists Already? Remember when I posted this piece detailing how Federal officials are being "trained" (brainwashed?) to watch pro-lifers as they engage in First Amendment activities? The training, of course, was offered by "unbiased experts" such as Planned Parenthood, National Abortion Federation, et al. The 40 Days for Life campaign is occurring now throughout the country. One is going on in Fairfax VA. Watch this report (UPDATE: The original link no longer works, as the video was removed and uploaded to youtube. Click here if you can't see embedded video) as the Fairfax group describes an apparent surveillance operation. They appear to be the targets, and Department of Homeland Security seems to be engaging in the surveillance. Can we all say "Big Brother is snooping"? British Columnist's Murderous Kind Of "Maternal Love"
Thanks to American Papist for the alert. Click on the link for more commentary, and follow their link to Glen Beck's piece on this madness. If we don't think it can't happen here, I point out it's already here! Remember Terry Schiavo, over five years ago? Closer to home, in Manassas VA, remember Hugh Finn, over twelve years ago? These elections in November are critical. Even more critical is the need to pray for God's mercy, and then to speak out. In this World Net Daily article, we read how Robert George (one of the Manhattan Declaration authors) attended a conference where a packet of historical documents was distributed. He noticed right away the omission from the Gettysburg Address. I agree. There is no doubt that they know what they are doing. Let's shine the light on these misdeeds. And remember in November! I was in the checkout line at a grocery store yesterday and saw the October 4th issue of Time magazine (pictured at right) at the stand. The title itself is an admission that human life begins at the moment when sperm meets ovum. Here's the title: How The First Nine Months Shape The Rest Of Your Life. Please note that the grammatical structure and vocabulary used indicate that "the first nine months" is truly a part of the human person's life. The article by Annie Murphy Paul starts on page 51 of the print addition. In the third paragraph she mentions "your life as a fetus". Note the personal possessive adjective "your". Of course anyone with any knowledge of Latin realizes that "foetus" simply means "little one". Going further down that paragraph, she mentions influences upon the mother "while she was pregnant with you". Again, take note! She was pregnant with... a blob of tissue? A clump of cells? Products of conception? No! She was pregnant with you - a person! Proceeding to the next paragraph, we see that "the first nine months of gestation constitute the most consequential period of our lives". So it's a period of our lives, no less so than early childhood, adolescence, etc. Since it is our lives, it is not a period in which our lives are subject to anyone's so-called "choice". Moving on, we read about "conditions we encounter in utero". There it is - another personal pronoun, admissive of human personality. I truly suspect that most of the intelligent pro-abortion people really don't believe the attempts at self-delusion, the ones that chant that the baby isn't truly a human being with his/her own God-given rights. Articles such as this one are admissions of truth, be those admissions ever so inadvertent. Go to the store and pick up a copy. Read it for yourselves. Write to the editors and thank them for acknowleding the human personality of the unborn child. You can bet that the progressive pro-aborts are excoriating them. First, thanks to Breitbart.tv for the heads-up on this. If you want graphic (and I DO mean graphic!) evidence that the Culture of Death is behind the latest environmental and "going green" fad, then continue. It's far-fetched, you say? Remember James Lee (see my first, second and third posts on him) and the situation at the Discovery Channel building last week? How about Earth Liberation Front - or the Unabomber? Anything that puts human welfare on a par, or even below, anything else in creation is deadly. It is we, mankind, who are created in God's image and likeness. Let's remember this when we read about "environmental justice committees" in our parishes, or the next time they try to foist a "lenten carbon fast" (put the phrase "lenten carbon fast" in the search box to see relevant posts) down our throats. According to this Cecilwhig report, my home state of Maryland probably one of the most deadly places in which an unborn child can find him/herself. I've known for some time that the annual abortion number is 38,000 baby murders per year. Minors seeking abortions in Maryland need notify only one parent. Note that they must only "notify" the parent, not seek his/her consent. However, even that can be waived if the doctor believes the minor is capable of giving informed consent. Of course the doctor has a financial interest in performing the abortion. How convenient for the abortionist! Maryland is one of three states that don't require abortionists to report their procedures. According to Vicki Saporta, president of the National Abortion Federation, "The state respects a woman's right to make her own decisions about an unwanted pregnancy while providing good access to safe practices." Consider the source and understand what that truly says about Maryland. Those of us who've been in the pro-life battle for a while remember the struggle in 1992 against Maryland SB 162, which struck down any vestige of protection for the unborn child in Maryland. Should Roe v Wade ever be overturned, all that would do would be to remand the abortion battles back to the states. Some misguded libertarians believe that the state is the proper place for such matters. In so promulgating this nonsense, they elevate their rarified concept of the US Constitution above its intent, "to preserve the blessings of liberty to ourselves and our posterity." I think our Founding Fathers would be horrified to see some citizens opining that if some wanted liberalized abortion laws in their states (that is, license to murder) then that would be constitutionally permissible. We need a Human Life Amendment (discussed in a previous post) to ensure that all babies are protected in the entire United States, regardless of the caprices of the already-born citizens of some states. I received an email today, detailing a litany of the misdeeds of various abortionists. Just take a look at the women who died as a result of this so-called "safe procedure". Now the tome..
Abortionists have been getting some well-deserved press lately. These are usually not the stories that make the national news. woman. Prosecutors alleged that he failed to monitor her while she was under anesthesia, delayed calling emergency services when her heart stopped, and later lied to try to cover up his actions. Then there is Dr. Andrew Rutland who, according to the California Medical Board, "committed repeated negligent acts in his care and treatment" of a patient who died after being given drugs in preparation for a second trimester abortion at a California facility. and parts of aborted fetuses were displayed in jars." The Pennsylvania Department of State's Board of Medicine described his continued practice as "an immediate and clear danger to the public health and safety." And the Maryland Board of Physicians recently suspended the license of Dr. Romero Ferrer, while investigating the death of a 21-year-old mother of a toddler. Ferrer is alleged to have given the woman an overdose of pain medications during her abortion. Have you heard about Bertha Pinedo Bugarin, who owned of a chain of abortion centers in California? She is currently serving a prison sentence of three years and four months, convicted of pretending to be a physician and doing abortions without a medical license. She pleaded "no contest" to seven felony counts for having placed more than a dozen women at risk by doing surgical abortions or giving them the abortion drug RU-486 without medical training. which was not licensed to do abortions past 14 weeks, and then had the women drive in a caravan to Maryland, where the other two doctors finished the abortions, under his direction. Authorities say that when one of these women was seriously injured recently during the abortion, Brigham put the semiconscious, bleeding woman into the back of a rental car and drove her to a nearby hospital, rather than call an ambulance. Police later raided his Elkton, Maryland facility and seized 35 frozen late-term fetuses and fetal parts. Promoters of abortion once argued that it should be made legal to protect women from notorious "back alley" abortionists. "Safe and legal" was constantly repeated as though these two words mean the same thing. In reality, abortionists simply moved from back alleys into storefronts, and some of them still retained their alley character. Enjoying the protection of law, while being virtually unregulated, the U.S. abortion industry continues to harm countless women while destroying more than a million children each year. Now that our new health care law is slated to help expand insurance coverage that includes abortions, we should probably expect to see more abortionists in the news, and more mothers and children suffering the consequences. We will need to amend that law, so the destructiveness of abortion will not be sold as routine "health care" to more and more women in our country. So ends the email. Here's a link with yet more deaths of women caused by abortion. Of course, all this doesn't even begin to count the millions of babies who were murdered. Of course the current oligarchy that occupies Washington DC at this time enjoy their positions in part due to contributions from these baby-killers. That's why they get off scott-free while the Obama administration tries to brand as "violent" those of us who try to save babies and their mothers from the messiah's donors. Emanuel: Obama "Toughest Leader Any Country Could Ask For"
It truly is amazing the damage he's been able to inflict between jaunts to Martha's Vineyard and various golf trips, dinner dates in New York City, etc. Anyway, Emanuel is rumored to be considering a run for mayor of Chicago. The squid machine there will probably trot out the Daley-Dead-Vote machine to get him in there - unless enough good people in Chicago rise up and say "enough is enough." That is exactly what we must do in November 2010. Only then will we be able to stop the massive hemmoraging that is now occurring on all strata of life in this country.